Update: The tour is sold out! The Capital Region has a rich history, some of which can be found in books and museums -- and some of which... well... not so much. This area has its fair share of stories -- some truer than others -- of gangsters, bootleggers, political bosses, and gin mills . 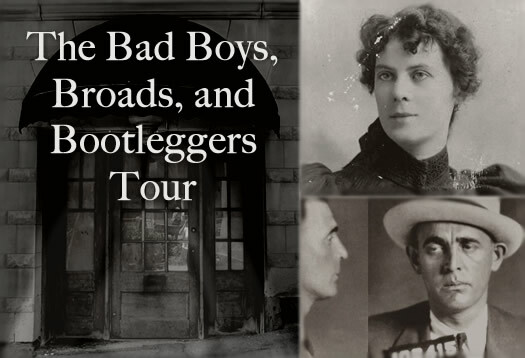 So on Wednesday, August 7, AOA is hosting a "Bad Boys, Broads, and Bootleggers" trolley tour. Local history buffs Maeve McEneny and Duncan Crary will lead a raucous excursion into our region's infamous illicit past filled with stories your history teacher didn't want to tell you. + And a whiskey tasting at Albany Distilling Company. We'll end the evening hanging out at the Albany Pump Station where your tour ticket will get you a free beer. There will be swag, prizes, and other surprises along the way. Last year Maeve and Duncan led the really fun Troy > Albany Aqua Duck tour for AOA. That tour sold out within 24 hours, so check your calendar, coordinate with your friends and get your reservation today. Trolleys for the the AOA Bad Boys, Broads, and Bootleggers tour will be provided by Advantage Transportation and Harmony House Tours helped pull the whole tour together. The event is sponsored by The Lofts at Harmony Mills, the Cohoes Local Development Corp, and The Downtown Albany BID. You had to do this after I left, huh. I hope this goes over really well and you decide to do another one. Sounds like a great time. I went to order tickets as soon as I read this. Sadly though its listed as sold out. I hope it proves popular and another tour is set up soon. It's too bad it sold out already. Albany needs to have more of these types of things. I don't know why we dont capitalize more on the history of this awesome area. Of course... I take a day off from work and the Internet, and you post this incredible tour.. note to self: if anyone tells you again that it is healthy for you to take a day away from the Internet, it's BS... looked what I missed out on! Waiting list? This broad needs one! Will there be a second tour for those who didn't get a chance to sign up in time?